Quiet wooded and mountain views await you from the rocking chairs each peaceful morning in this charming 2-bedroom, 2-bathroom cabin located in Cobbly Nob Resort near hundreds of attractions in downtown Gatlinburg, Tennessee. Four guests will find all the rest and relaxation of the Smoky Mountains while soaking in the outdoor hot tub and eyeing majestic mountain peaks rising over the forests after fun-filled days of exploring the downtown Parkway. After discovering your new favorite wines along the Rocky Top Wine Trail, bring your bottles home to enjoy while seated around the plush suede couches. 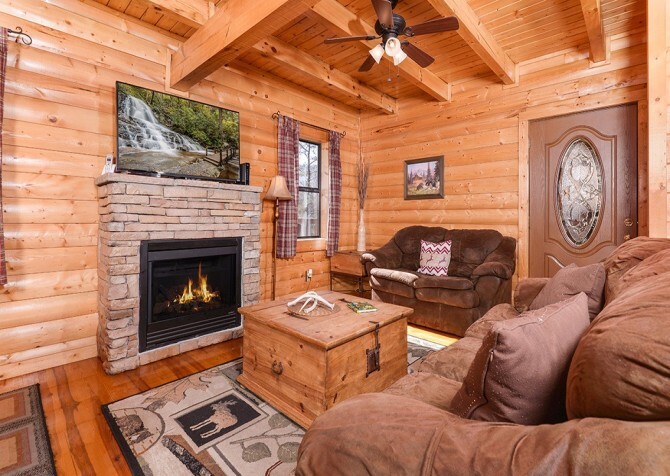 Unwind on quiet evenings as warm flames dance in the gorgeous stacked-stone fireplace and a Netflix movie plays on the impressive 50-inch flatscreen on the mantel. Share cherished moments while appreciating family or a group of friends as you play board games around the dining room table following delicious cabin-made meals from the fully loaded kitchen. 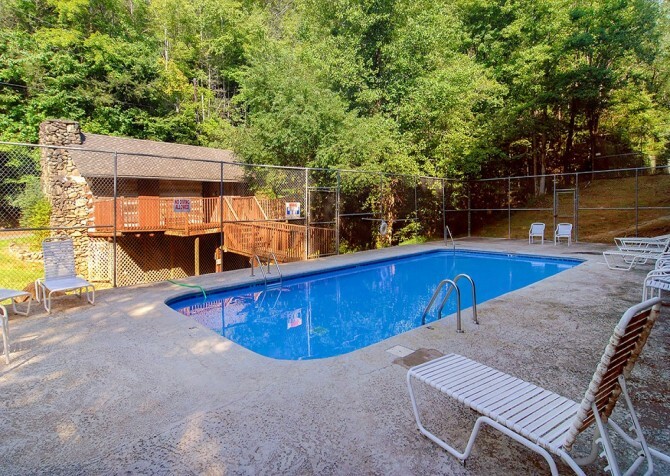 Cool off in the summertime in Dollywood’s Splash Country in nearby Pigeon Forge or right down the road in your cabin’s community pools! 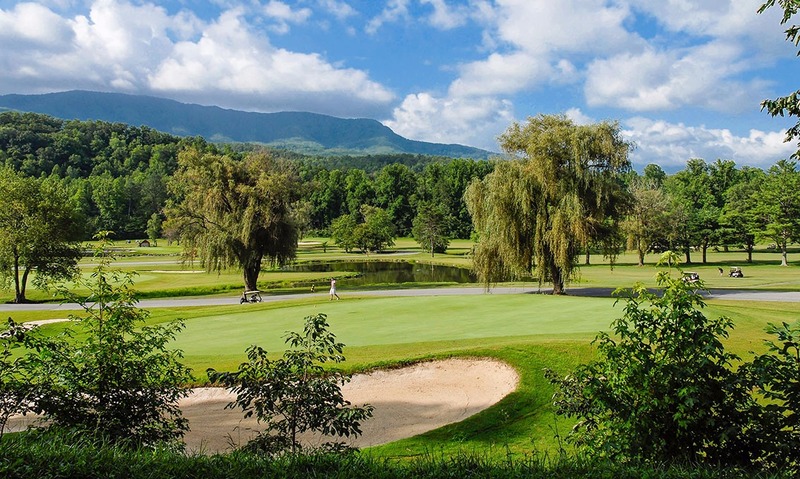 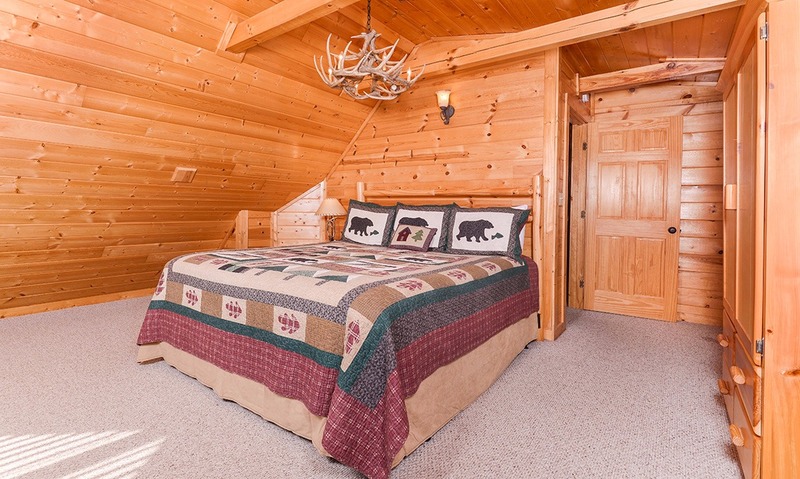 After scenic hikes, thrilling whitewater rafting, or golfing in the incredibly beautiful Bent Creek Golf Course only minutes from your cabin’s resort, come home to king and queen-size beds, flatscreen TVs, and cozy furnishings in each bedroom. In the impressive master suite, enjoy alluring mountain views from the large windows as you wake each morning or peruse the internet in the reading chairs while using the high-speed internet. Even cabin downtime is fun when you are hanging out in the loft rec room, shooting pool and listening to some music on the CD player. 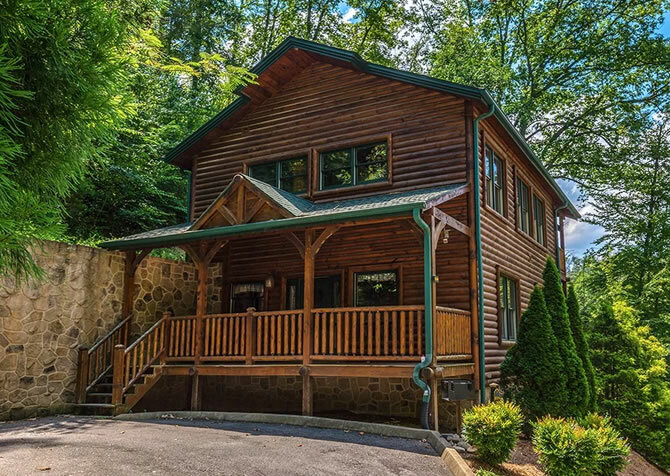 Surrounded by gorgeous mountain-motif décor and lush Smoky Mountain forestry, your stay in Cozy Cabin is guaranteed to be relaxing and the perfect balance to all the excitement of downtown Gatlinburg and Pigeon Forge. 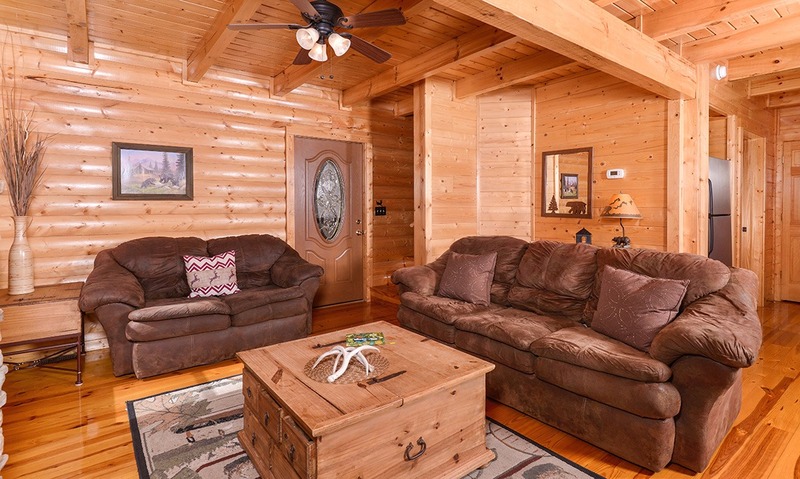 Whether you are enjoying your favorite book or squeezing in an afternoon nap, guests will love sinking into the plush suede couches of the warm, inviting living room area. Kick back with your favorite Netflix show while revisiting every savory bite of your leftovers from the Old Mill Restaurant or host a great family movie night on the 50-inch flatscreen TV complete with bowls of popcorn from the microwave, bottled cokes from the Moon Pie General Store, and a dim fire in the stacked-stone fireplace. 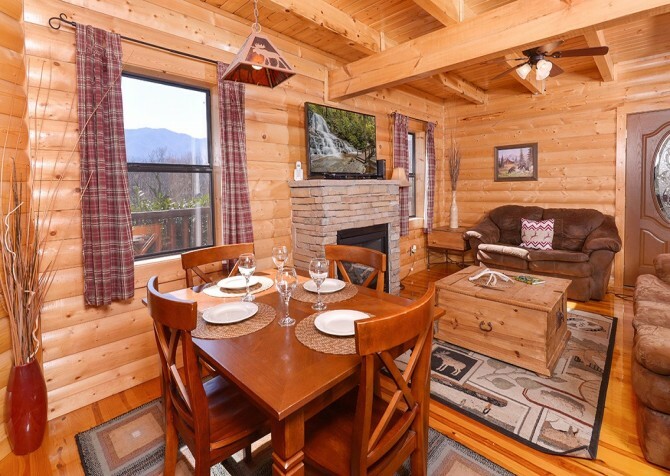 Use the large wooden chest to set up board games with the kids or as the perfect spot for your glasses of wine while catching up with old friends by the fire after a long day of shopping and exploring Gatlinburg. 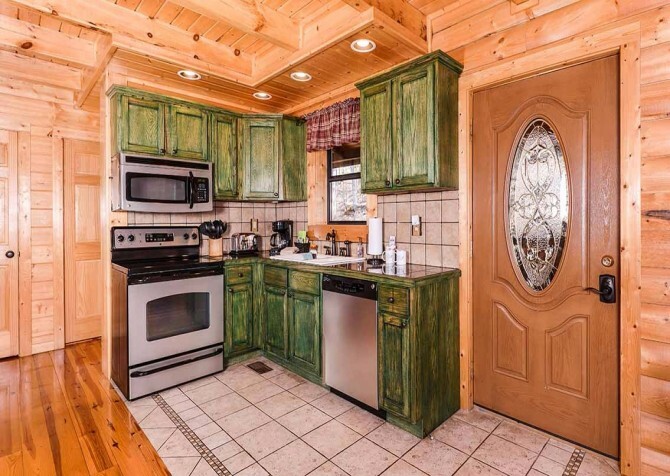 This modern kitchen with a Smoky Mountain twist is just the right size for putting together quick meals or multi-course dinners with the help of modern, stainless-steel appliances and every tool you need within your grasp. Brew fresh cups of coffee to pair with your pancake breakfast using the coffeemaker, reheat leftovers in the microwave as a quick fix to midnight cravings, and store your sweet treats, like fudge and candied apples from the Ole Smoky Candy Kitchen, in the full-size stainless-steel refrigerator. 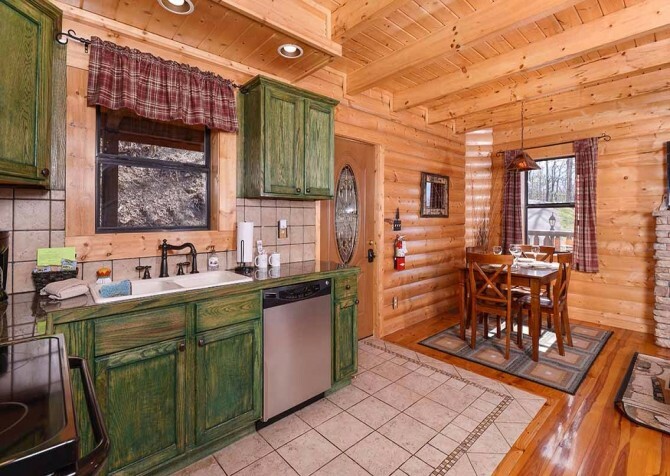 Set the dining table with the cabin’s charming dining set, along with glass stemware and utensils from the stained wooden cabinetry to make every meal extra-special during your stay in Cozy Cabin. 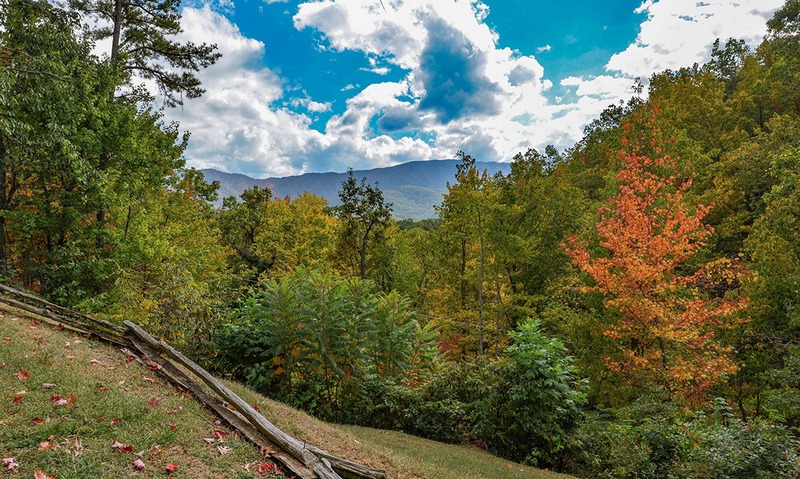 Gather around the lovely 4-chair polished wood dining set for meals, games, or fun daytime crafts with the kids after being inspired by your visit to the Great Smoky Arts and Crafts Community in Gatlinburg. 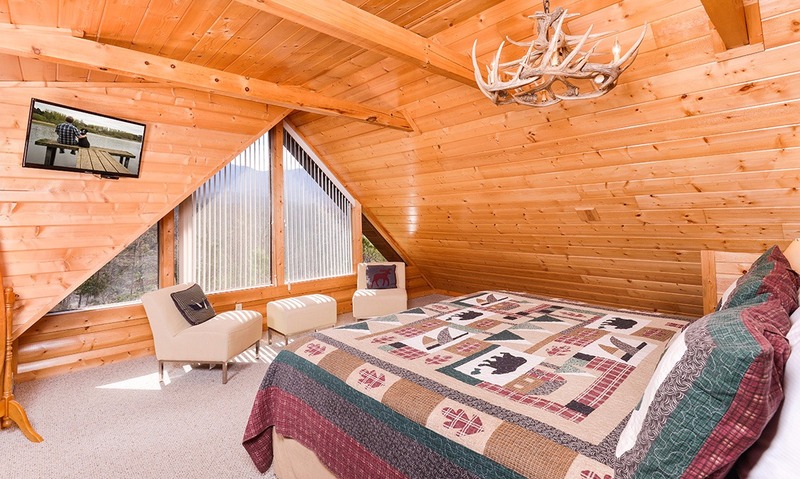 Hearty breakfasts and hot coffee can be enjoyed in the soft morning light drifting in through the nearby window while savory cuisines disappear under the moose pendant lighting during dinnertime. 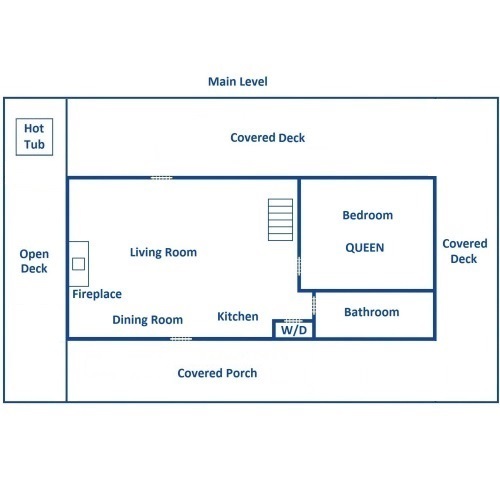 Clear the table and share laughs late into the night while playing card games and sipping on local wine and spirits from famous distilleries like the Sugarland Cellars before turning into the comforts of your bedrooms each evening. 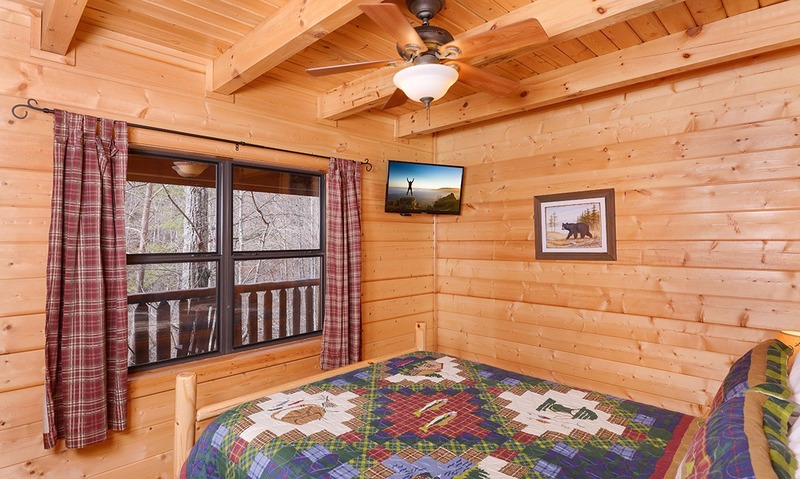 Quilted covers drape across large king and queen-size beds to provide plenty of sleeping space for up to 4 guests during your family getaway to the Smokies or a couples’ retreat with friends to Gatlinburg. 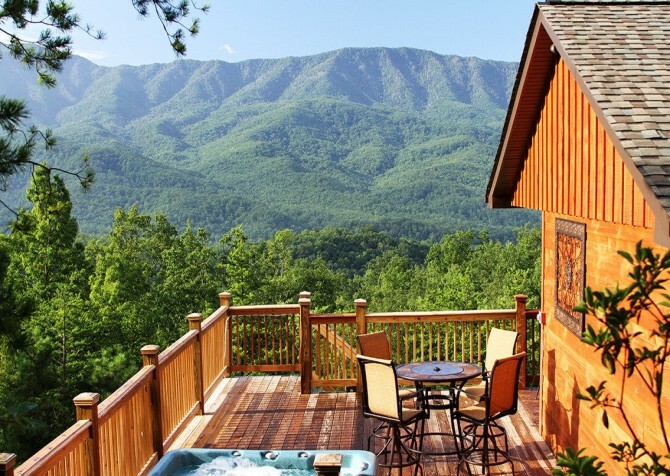 Flatscreen TVs, alluring lighting, and bedside tables and lamps invite you to feel right at home as you begin to drift off into a restful night of sleep at the end of each exhilarating and eventful day in the Smoky Mountains. The master suite lends ample floor space and dreamy natural lighting through the large windowed wall beyond the foot of the bed and the cozy reading chairs. 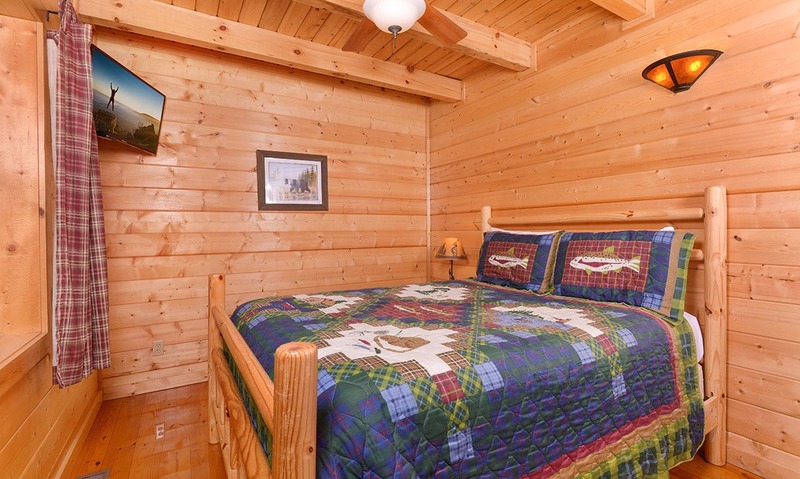 And as an additional comfort, both full bathrooms are located only footsteps away from each bedroom door. 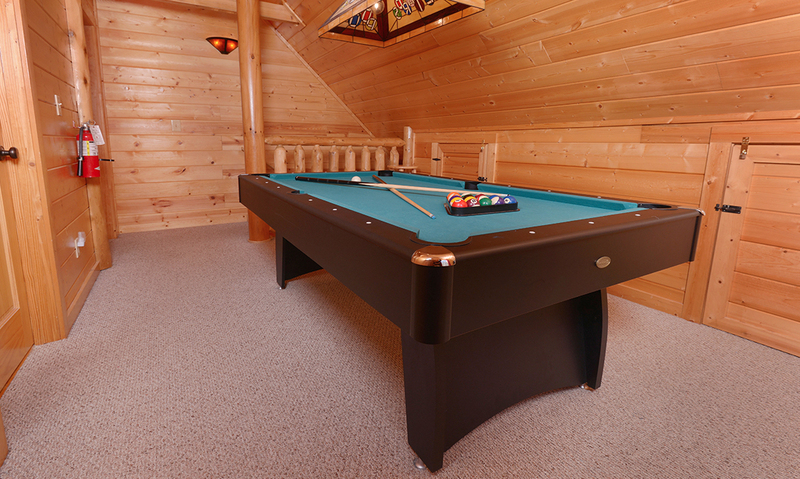 Enjoy your very own pool-hall vibes in the loft of Cozy Cabin. Unwind at the end of the day with a couple beers and a few rounds of 8-ball on the pool table as music plays on the CD player or you practice your trick shots before leaving the cabin for your next adventurous excursion on the Pigeon River. Lovely log banisters line the spacious wrap-around deck boasting alluring wooded and mountain views of the Smokies. 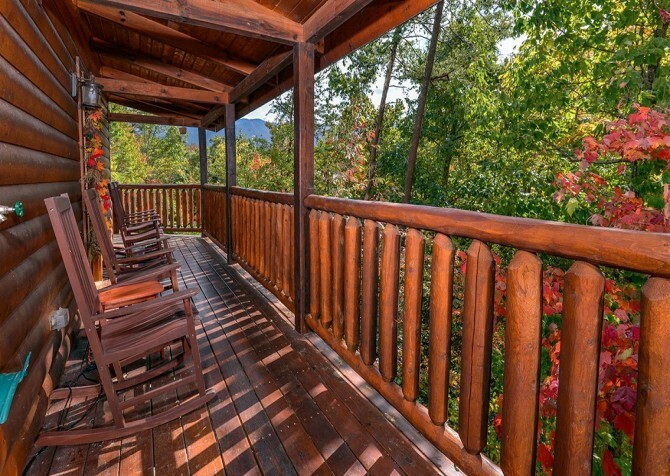 Settle into your rocking chair with a hot cup of coffee to begin each day with this form of tranquil introspection with the stresses of home far, far away. 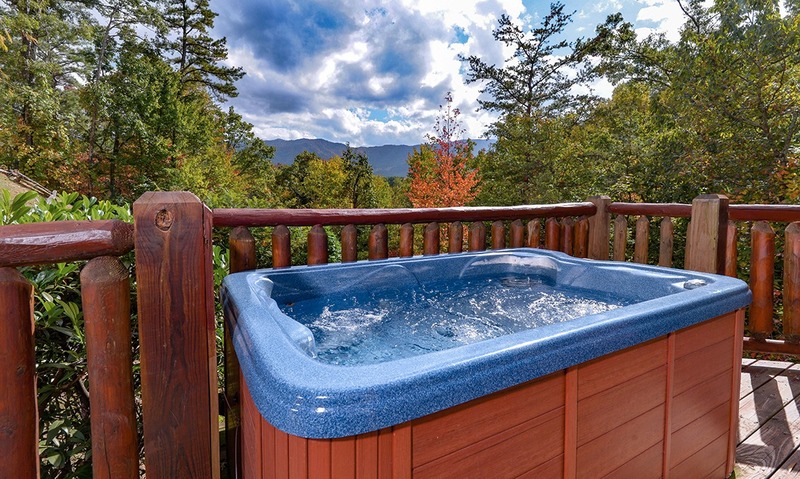 After scenic hikes to Clingmans Dome and Rainbow Falls, rest tired feet and productive muscles in hot, bubbling waters of the outdoor hot tub as dusk fades and the stars appear one-by-one. Summer afternoons are well spent lounging around the community pools of Cobbly Nobb Resort before returning to the cabin for burgers and hot dogs fresh off the grill for the perfect cookout with mountain views! 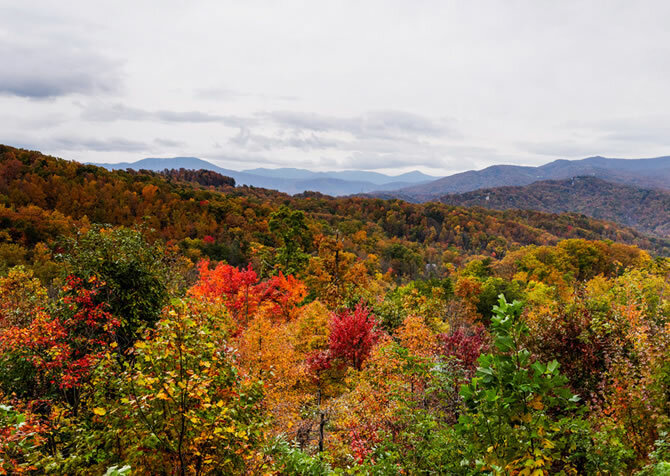 It’s a day of carnival games, freshly fried Ogle corn dogs, and funnel cake, right in the heart of downtown Gatlinburg where kids and adults can play for prizes or just for fun before taking a break for a mouthwatering treat from the snack bar! There is exciting fun awaiting year-round in the area’s only ski resort where guests can glide along the indoor rink in ice skates, bump around in Ice Bumper Cars, or climb an impressive rock wall outside before getting a bite to eat in the Ober indoor mall. 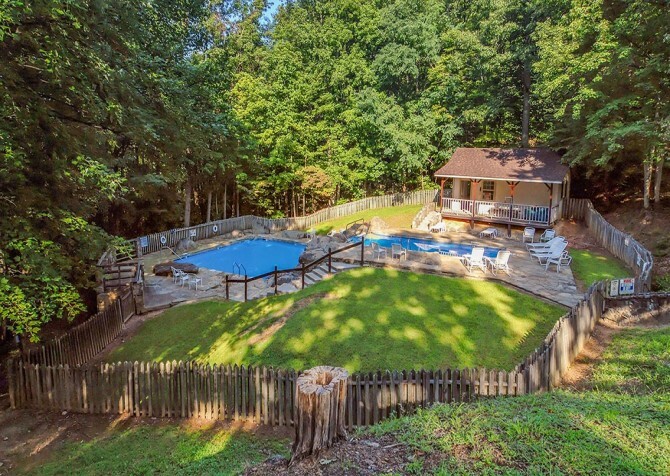 As the area’s oldest haunted house, come and see the decrepit mansion that trapped the poor souls of an entire family before recruiting more unfortunate, nightmarish beings within its walls. 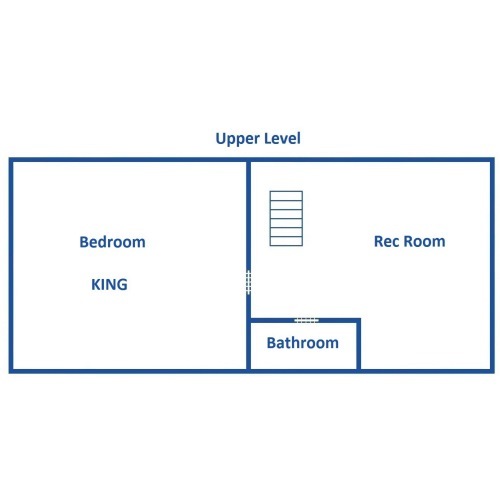 Work with your friends and family to find your way out of each room before becoming part of the exhibit! "I cannot even begin to express how pleased I am with cabins for you! This is now my second time renting from them and the process is so extremely easy. 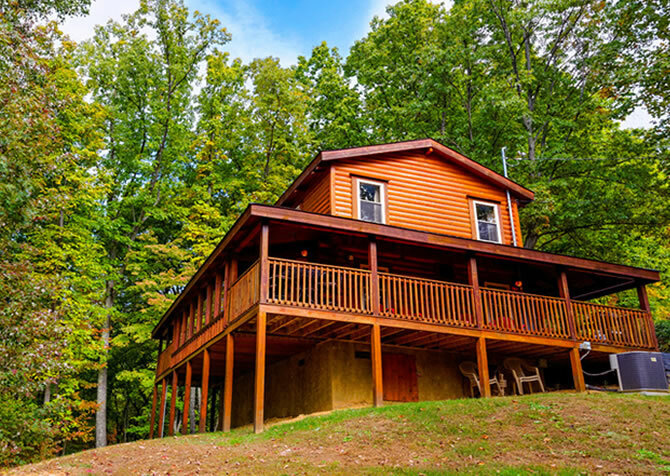 You get emails from them before you go on your trip, during your trip, and…"
"I cannot even begin to express how pleased I am with cabins for you! 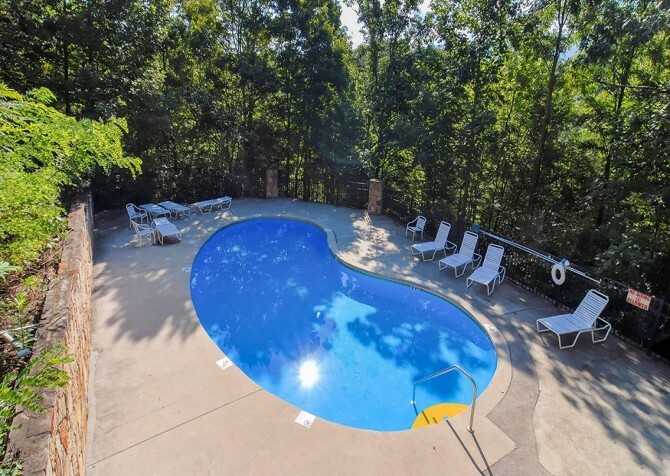 This is now my second time renting from them and the process is so extremely easy. 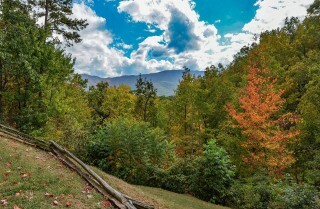 You get emails from them before you go on your trip, during your trip, and after your trip. It really makes it seem like they care about your experiences. I have been extremely happy with both the cabins I have rented, Both were beautiful with beautiful views and again I just could not imagine using another company other than cabins for you. This has become a yearly tradition to rent a cabin and I will use cabins for you for the duration of our trips!! I also wanted to mention that everything is done online! 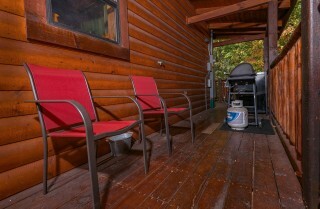 You never even have to go into an office!" Steve, words cannot express how happy we are to receive your review! 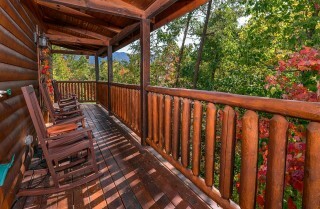 It means so much that our guests enjoy their cabin rental experience in the Smokies from pre-arrival to the ride home. It's always a pleasure to serve YOU, and we look forward to your future visits. 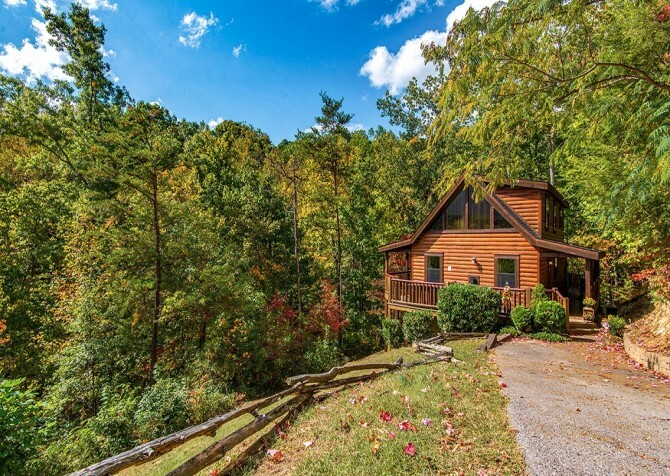 "Awesome Cabin with awesome location. All in all fabulous experience." Thank you so much for leaving us a wonderful review! 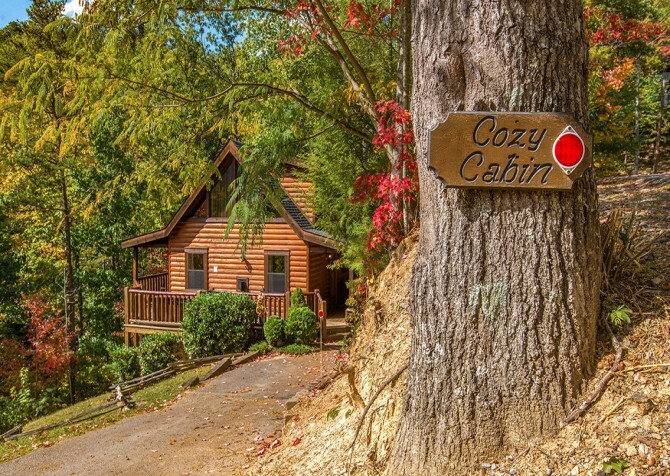 We are so glad that you had a fabulous experience at Cozy Cabin! We look forward to serving YOU again in the future! "Our stay was wonderful! From the time we walked in it was very clean. Everything was just right, and the hot tub and rocking chairs on the wrap around porch were in a picture perfect setting. 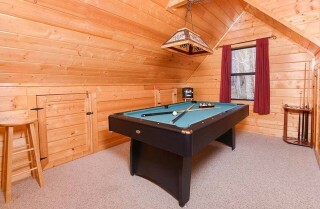 Hoping our next trip will include a cabin with an indoor pool! Thanks Cabins for you!" "This was our first cabin rental in Gatlinburg, TN. The reservation and payment process was all online making it very easy. Their web site gave complete info on the cabin with many photos and when we arrived, it was exactly as we expected. They call two days before your stay to give you a code for the cabin door lock. 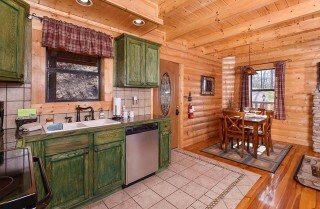 The cabin was amazing, beautiful setting, well equipped, with cable TV and Wi-Fi. I highly recommend using Cabins for You."